Brian and I are enjoying a vacation at Disney with our son Dan, his family, and his in-laws. 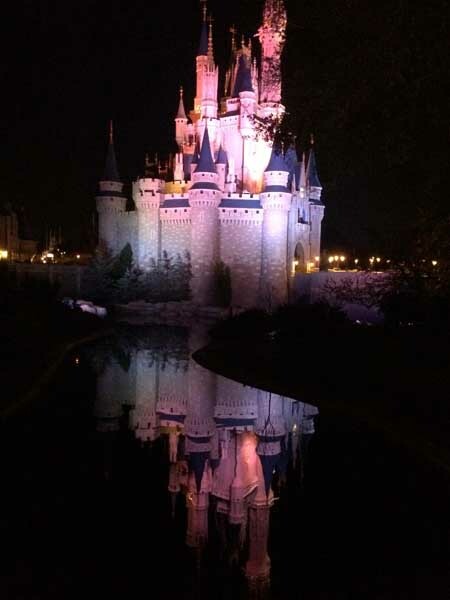 There is nothing better than quality time with the family; except maybe quality time in a magic kingdom. Everywhere you look everyone seems to be totally enjoying themselves, suddenly all around us, about nap time for their little ones, everywhere you look there’s a baby crying. As wonderful as it is, Disney can just be too much. Our big guys hung in quite well for the most part, we only had a couple of tantrums, some minor whining spells, less than a dozen reminders to keep their hands to themselves, and they only played swords with their forks and knives for a moment, but hey, they’re grandpas! What can you expect? The grandsons were wonderfully behaved. I think when I was a child I thought heaven would be something like Disney World. Of course everyone would have the fast pass, and all the restaurants would be free, and you wouldn’t have to decide which souvenir to buy because everyone you love would be there. You wouldn’t need money, or naps, or sunscreen; everything would be perfect. What is it about Disney that makes everyone want to go there? It’s really not much more than a multi-acre, money-vacuum, non-stop-commercial for everything Disney. Why do we love it? I was thinking about that as we rode the monorail back to the station where we picked up the tram to ride over to the parking lot to get the car to drive back to the hotel. As I was thinking I looked at my tired husband holding our grandson who was smiling from ear to ear, which was pretty much the same way they started the day about fourteen hours earlier. We were together all day, doing fun things, experiencing new things, and making memories with people we love. I wonder if that is what heaven will be like. I wonder if that will be a tiny portion of what heaven will be like. We know that we will see and recognize each other in heaven. We know that heaven is unending. We know that we will have no tears in heaven. We know we will love perfectly. While we had a perfect day yesterday, or as perfect as you can have on earth, we know there are days here, even at Disney, that are not perfect for everyone. We know there will be no fatigue, boredom, meltdowns, or hunger, or that we will be too hot or too cold. But we can’t begin to imagine what heaven will truly be like. We may often think of heaven with an idea of spending eternity with the people we know and love today, but more important than that, we will be spending eternity worshiping the Lord Jesus Christ! Perhaps because our purpose and focus in heaven will finally be completely God-centered, that is why heaven will be perfect. One thing that stood out to me today, was the perpetual music. I don’t think I will mind the constant sound of praise in heaven. I think I will enjoy it. We will have the glorious privilege and pleasure of praising the King we love. And there is only one way to get there. There is no tram, no monorail, no shuttle; there is only the Gospel. And that Gospel is the totality of the perfect life, death, resurrection and exaltation of the Lord Jesus Christ, the Word, who was With God and who was God (John 1:1). Disney has nothing over heaven. Have you made the decision to surrender your heart and life to Jesus? What about the people you love, have you, will you, share with them the way to heaven? I had to chuckle over how real you described that experience, Marcia! Some things never change, and I’m glad heaven will be like that (not that Disney world is that great) also..your description of the awesome experience of heaven makes Disney seem rather ho-hum! Heaven will be better for us that have a ticket that says next one please. Our ticket has been stamped by the almighty. It says next please.